Railpictures.ca - John Pittman Photo: GMTX 2254 (GP38-2) works Aldershot Yard with the help of CN4784 (GP38-2W) and CN7083, CN4138 (GP9rm). It’s the preferred cab on a hot summer day because it has air conditioning. The yard office can be seen partly hidden by the boxcar. Rail joiners have been highlighted with white paint. The engines are paused close to Aldershot GO/VIA station – platform access is through a tunnel under the yard (the south parking lot is closer). After Aldershot station was completed, VIA ended service to CN’s Burlington, Dundas, and Hamilton stations. | Railpictures.ca – Canadian Railway Photography – photographie ferroviaire Canadienne. 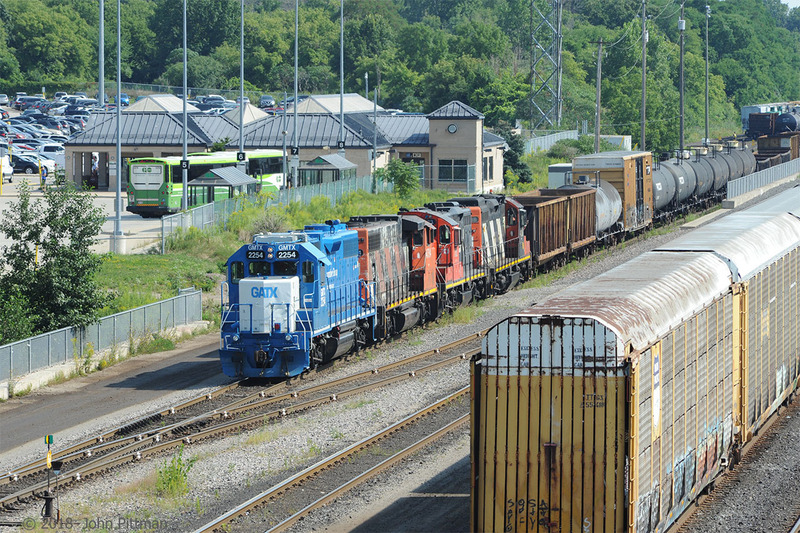 Caption: GMTX 2254 (GP38-2) works Aldershot Yard with the help of CN4784 (GP38-2W) and CN7083, CN4138 (GP9rm). It's the preferred cab on a hot summer day because it has air conditioning. The yard office can be seen partly hidden by the boxcar. Rail joiners have been highlighted with white paint. The engines are paused close to Aldershot GO/VIA station - platform access is through a tunnel under the yard (the south parking lot is closer). After Aldershot station was completed, VIA ended service to CN's Burlington, Dundas, and Hamilton stations. That is one possibility. Cars dropped at Aldershot can be switched into lifts to go out on any of the 4 nearby subs – Oakville east (Oakville, Clarkson, Mimico yards), Halton sub (Malport, BIT-Chrysler, Macmillan yards), Dundas sub (Brantford, Paris, etc), Oakville west-Grimsby (Hamilton, Parkdale, Port Robinson) + other destinations. It’s a handy place for a yard; as I recall, CN wanted to expand it but City of Burlington did not approve. Assembling the transfer run to Hamilton?